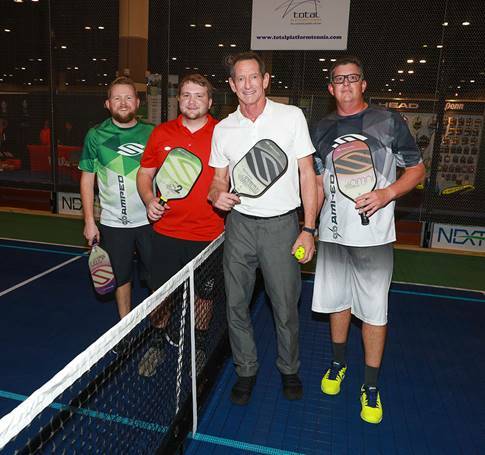 Acclaimed Golf Instructor Hank Haney is joined by (L) Mike & Rob Barnes, founders of Selkirk Sport, and (R) Daryl Nap, as they showcased Pickleball at the inaugural Racquet & Paddle Sports Conference in conjunction with the 2019 PGA Merchandise Show, January 24 at the Orange County Convention Center in Orlando, Florida. In addition to being one of the world’s most accomplished Golf Instructors, Haney is also a passionate Pickleball player. With a regulation Pickleball court constructed on the PGA Merchandise Show floor, Haney took advantage of the opportunity to play the game alongside 40,000 golf industry professionals in attendance. Pickleball is an exciting sport that combines elements of Tennis, Badminton, and Ping Pong. It is one of the fastest growing sports in the USA with more than 3 million active players today, and Selkirk Sport is the leading Pickleball equipment and accessories brand.